The intent of this course is to teach the student individual tactics and the use of the rifle in close range, high speed, defensive scenarios. The individual will learn rapid assumption of various shooting positions to maximize the use of cover and concealment and to provide for a more stable firing platform. Tactical management of danger areas such as doorways, corners, stairwells, etc. 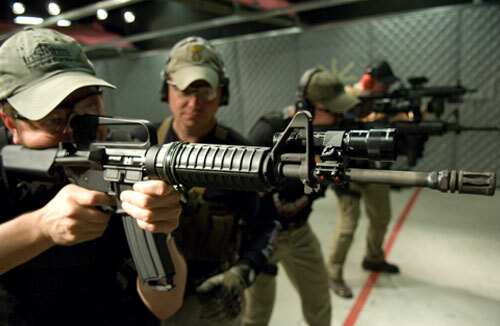 Realistic ranges, rifle ballistics and "stopping power"
Semiautomatic, magazine-fed, iron-sighted rifle with sling (low power optics acceptable); 1000 rounds of brass-cased, FMJ ammunition minimum (no steel core ammunition); 3 rifle magazines (minimum); YOU can shoot part of the class with 22lr AR training guns such as S&W MP15-22; Handgun with 100 rounds and holster gear; Rifle mounted flashlight(this can be as simple as a handheld tactical light taped to the rifle for this level course); Hearing and eye protection; Knee and elbow pads recommended. Q: What rifle do you recommend? A: For a serious defensive rifle, we recommend the gas impingement AR-15 platform, specifically one built by Colt, LMT, Bravo Company MFG, Daniel Defense, or Noveske. Q: What type of lubricant should I use? A: It does not really matter as long as you keep the gun wet with lubricant. Q: What type of cleaner should I use? A: If you keep the moving parts wet, any carbon will easily wipe away with out a solvent. If you want a cleaner, then we recommend Slip 2000's 725 cleaner/degreaser. It works well and does not have a lot of the harsh chemicals found in other cleaners. Q: What "zero" do you recommend? Q: What sling do you recommend? A: An adjustable two point sling is the most universal setup for most users. Most of our instructors use a padded Viking Tactics two-point adjustable sling. Q: What type of optic should I use on my rifle? A: Iron sights work great and new users should start there. However, non-magnified red dot optics are a requirement for a serious fighting gun. We recommend both Aimpoint and Eotech, Specifically the Aimpoint Micro Series or the Eotech XPS series. The less expensive optics are generally not worth the money. Q: What iron sight should I use? A: The Troy Industries folding rear BUIS is the best option and the only one we recommend for serious use. Q: How should I carry my spare mags? A: For a private citizen, the easiest way is to use one or two belt mounted pouches (such as the version by Blade-Tech) behind your handgun mags (bullet tips to the rear). Law enforcement or military should carry their spare mags as they would when deployed.